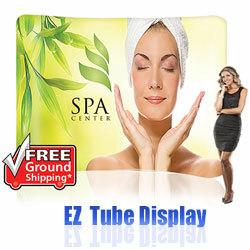 The EZ Tube display is a a tubular frame system, the frame sections fit together to make the tradeshow booth frame. The fabric stretch fabric pillow case graphic fits snugly over the frame to create a seamless and eye catching display. Trade Show Truss Kits are heavy duty exhibit booths with stunning printed graphics Requires NO TOOLS for set up, simply twist and lock! Expo truss systems can be reconfigured in multiple ways using the same parts allowing you to have a different exhibit for each show. 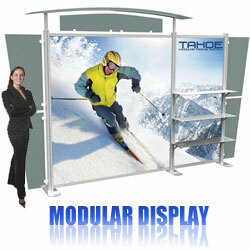 Tradeshow Modular Displays are highly portable booths with vibrant full color printed graphics. The modular systems versatility make it fully customizable. Change the look of your display at every show. Modular exhibits are long lasting displays with a Lifetime Guarantee on all Hardware. How to Choose a Tradeshow Booth for Your Next Marketing Event! Need help selecting a tradeshow display? Our Sales team can help you choose the best marketing display for your booth exhibit? Stop Traffic at Your Tradeshow Exhibit! 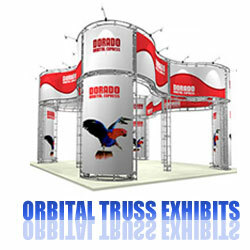 Dynamic trade show booths are professional marketing displays that present your marketing message in style. Stunning high-quality printed graphics grab attention and attract traffic to your exhibit, winning you more business. Our tradeshow booths are designed for easy set-up & take down. Compact storage and convenient shipping save you time and money. We offer several styles of trade show booths to meet your needs and budget. Learn About Tradeshow Booth Displays? 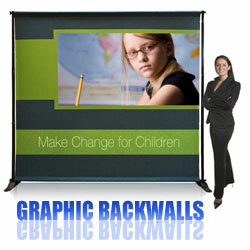 Booth displays can be setup as backdrops, back walls, or center island booths. All our booths are stylish and offer the wow factor in your tradeshow exhibit. A booth display is a marketing teams best and biggest attraction source for stopping traffic at your booth. The most compelling advantage of tradeshow booths is that graphic designers can create big bold interesting headlines, contrasting colors, and a creative graphic image for the wow factor. Regardless of the style you choose, our marketing displays are designed to attract attention and promote your marketing message to win you more business. Tradeshows are one of the best and most meaningful ways to make business connections. The main advantage of tradeshows is that you can communicate in the most effective way… face-to-face! Now you know all about tradeshows—so order your display from Anything Display! You won’t be disappointed. 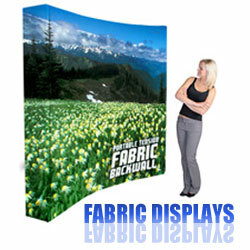 This stretch fabric popup display sets up in minutes. This is the quickest and easiest tradeshow booth on the market to setup and take down. The fabric graphic is seamless and stays attached to the popup frame for convenient storage and transit. 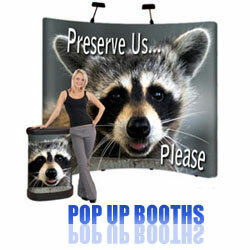 Pop Up Tradeshow displays combine style and reliability. The printed graphic popup panels are printed on a semi rigid roll-able media that holds it's shape for smooth rolling curves. Popup graphics attach to the frame with magnets. Graphic backwall's and backdrops make your whole booth come alive. Telescoping height and width allow you to use pre printed banners of different sizes. Full color printed banners can be printed single or double sided for maximum visibility.